On Thursday, Zarif took to Twitter to respond to Pompeo’s comments at the council, saying that he mocked the council by bragging about violating Resolution 2231 and even speaking of plans for more such violations. He said the “isolated” US became the first permanent member of the council to punish other countries for complying with Resolution 2231. Zarif further stressed that Pompeo’s remarks confirmed that Washington and its allies rely on “defunct” Resolution 1929. Tehran has always emphasized that it has no nuclear warheads and that none of its missiles have been designed to carry nuclear weapons. The International Atomic Energy Agency (IAEA) has repeatedly confirmed Iran’s compliance with the accord. 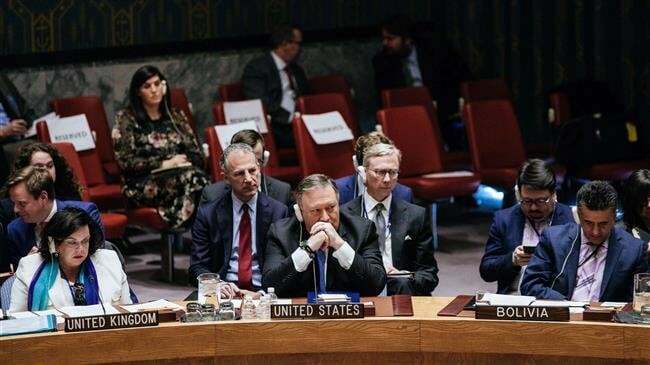 The Security Council met late Wednesday at the request of France and Britain days after Iran tested a conventional ballistic missile. At the meeting, the European allies of the US echoed Pompeo’s “concerns” about Iran’s ballistic missile activities. They, however, stopped short of claiming that Iran was violating Resolution 2231, and reiterated strong support for the Iran deal, instead, amid European efforts to protect the JCPOA as well as their business links with Iran in the face of US sanctions. “There is no proof that the ballistic missiles can carry a nuclear load,” Nebenzia told the council. “What they do not voice is any kind of a substantive proposal on this topic and sometimes we’re left with the impression that the only goal is to further escalate anti-Iran hysteria and to demonize Iran,” he said. Iran has repeatedly said its missile activities are in line with its deterrence doctrine, and that it will continue testing conventional missiles.